There seem to be a growing number of cases of high amounts of fluid in the lungs – known as noncardiogenic pulmonary edema – following administration of the opioid overdose antidote naloxone, experts said at a recent meeting of the New York Society of Addiction Medicine annual meeting. “The cause of naloxone-associated pulmonary edema is unclear. It may be that it is part of the natural history of opioid overdose, and we are just seeing it more often because we have the ability to save patients using an antidote. It could also be because when we wake people with naloxone, they try to take a deep breath against a closed airway, causing barotraumas – injuries caused by increased air or water pressure,” says Nicholas Nacca, MD, Assistant Professor of Emergency Medicine and Medical Toxicologist at the University of Rochester Medical Center. There is no hard data to support that this phenomenon has increased in frequency, but it certainly seems to be the case, he said. “The dose and route of administration have changed recently. Naloxone is now available in 4-milligram intranasal doses, which is higher than what we have used in the past,” said Dr. Nacca. “Previously, naloxone was available in 2-milligram doses.” In the controlled setting of an emergency room, toxicologists recommend giving the lowest dose of naloxone possible to reverse the respiratory arrest. This is different than in the field, where first responders, police and lay persons are using preloaded intranasal drug delivery devices. “Lives are being saved by these doses of naloxone, and at this time, complications may be a necessary evil,” he said. Another common issue with naloxone administration is that first responders may be used to administering naloxone via intramuscular or intravenous injection. 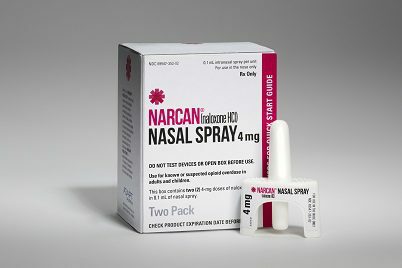 The naloxone nasal spray, which is now widely available, takes slightly longer to work, and some first responders may quickly give a second dose of the spray if the person does not start breathing right away.